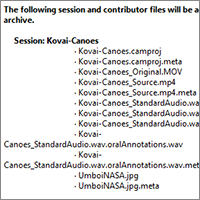 Recording speakers of the world’s languages is fun and rewarding, but keeping all the resulting files and meta data organized? Converting files to archive formats? Transcription? Painful. That’s why we built SayMore – to make common Language Documentation tasks fun and keep you productive. ...OR record directly into SayMore. Easily convert the media coming from your device into the formats you want for long-term access. Export to Audacity, ELAN, FLEx, Toolbox, or YouTube. Enter metadata about the project, people, sessions as a whole, and also for individual files. Add any kind of file related to the project, sessions, and people, including audio and video recordings, photographs, and transcriptions. Enter information about session participants. Add evidence of informed consent, be it audio, video, or photographs or a signed form. 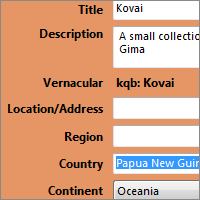 Single-click to rename a file according to a naming standard. Let SayMore auto-segment your media into bite-size chunks, do it by hand, or import from ELAN. 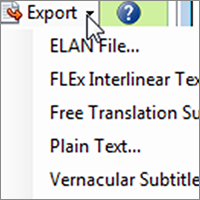 Transcribe and translate, then export to FLEx for interlinearization, or do further work in ELAN. 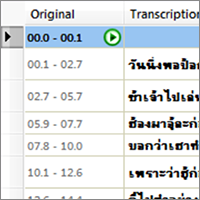 Enlist a native speaker to easily record Careful Speech annotations and Oral Translations. 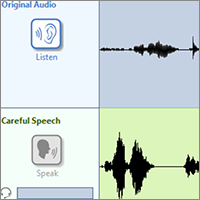 Get 3-track audio combining original, careful speech, and oral translations for free! View charts and other statistics of your progress. One click will package up your project or session in IMDI format, ready to use with ARBIL or other IMDI-compatible utility. SIL members can do the same to quickly submit a package of all the relevant files and metadata using SIL’s RAMP archive-submission application. Let me say Thank You to the dev team that has been working on SayMore! We are grateful for your work to put this tool in our hands. This is really great for us here in Nepal as we want to recruit mother tongue speakers for annotating a lot of data for the purpose of language documentation. I first thought I’d have to teach them ELAN, but SayMore has come just at the right time! Check out what we’re up to and planning on the SayMore Trello Board. Got an idea for SayMore? Jump over to our UserVoice Page to vote on existing ideas, or add your own.